Cold or room temperature pasta or side dishes are one of my favorite things to have with a meal. With my hectic schedule in the afternoon with the kids and their sports, long, labor-intensive dinners are not always an option. I usually menu plan the weekend before with accommodating meals for my schedule. I will plan on having quick and easy meals the evenings I know I won't be back until at least 5 or sometimes 6. Other times when I don't have to be picking up kids or bringing them to practice, I will make something that involves more of my time. Since I have more evenings that I am gone later, than not, I like to have plenty of fast or cold dishes to chose from. Especially if it's cold, I can make it earlier in the day. Makes my life a lot easier! This dish makes the ideal lunch, or quick dinner. Or, the perfect side to a steak or baked chicken. 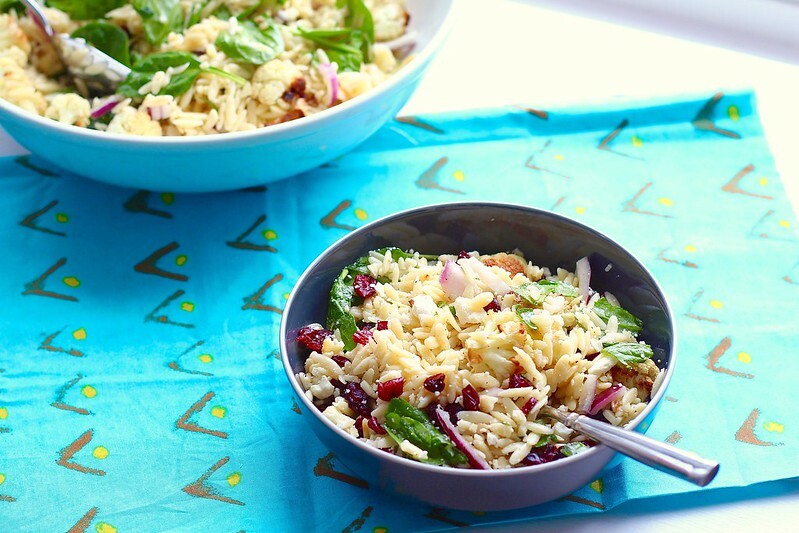 Cauliflower is roasted with garlic, then tossed with creamy feta cheese, orzo and sweet dried cranberries. There is a little of sweet and salty flavors going on here, the best! Make this for your lunches this week, or for dinner tonight, you'll love it! Preheat the one to 400ºF. In a bowl, combine the cauliflower with 3 tablespoons of the olive oil, garlic, salt, and pepper. Spread on a rimmed baking sheet in an even layer and roast until softened and golden brown, about 20-25 minutes. Remove from the oven and let cool. Meanwhile, bring a medium pot of water to boil. Cook the orzo according to the package directions but reducing the cooking time by 1-2 minutes. Drain well in a mesh sieve, rinse with cold water, and toss with 1 tablespoon of the oil while still in the sieve. To make the dressing, combine the olive oil with the lemon juice, honey, Dijon, salt, and pepper in a large bowl. Whisk to blend well. 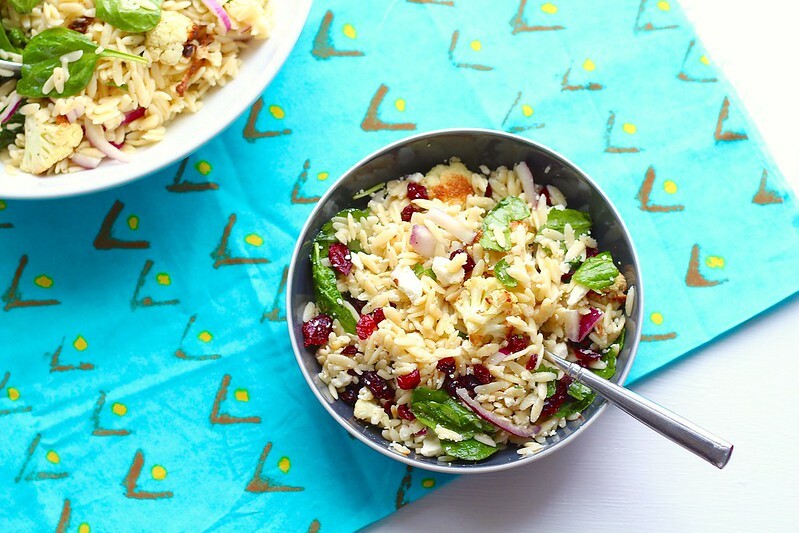 Add the orzo to the bowl along with the roasted cauliflower, onion, feta and dried cranberries. Toss until well combined and coated with the dressing. Add the spinach to the bowl and toss once more. Taste and adjust seasoning as needed. Serve cold or at room temperature.